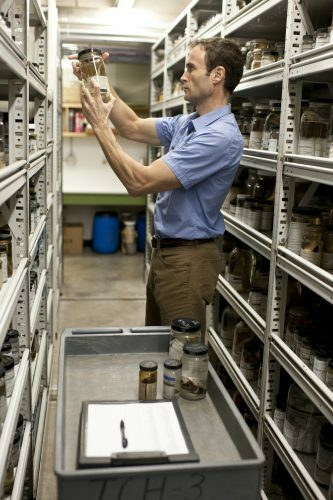 Specimens in the Florida Museum of Natural History’s Division of Ichthyology are collected, fixed, preserved, accessioned, and maintained according to prevailing international collection standards. Fishes for deposit in the division are collected in accordance with all applicable laws of the political entity in which they were obtained. Transfer of specimens across political boundaries is conducted in accordance with all relevant law. Copies of permits relevant to those fishes collected under special circumstance are maintained on file. Fishes are fixed by immersion in a solution of ten percent formalin. Large specimens and herbivorous or detritivorous species are injected in the visceral cavity and large masses of muscle with a solution of the same. The fixation process is typically 7-10 days in duration. Prior to preservation in ethanol, specimens are rinsed or otherwise submerged in water for 24-72 hours relative to mass. Used formalin of diminished quality as well as contaminated rinsate is processed as chemical waste through the University of Florida’s Department of Environmental Health and Safety. Following fixation, fishes are preserved in a solution of 70% ethanol. Skeletal preparations of fishes are made from fresh or frozen materials using scientifically accepted macerating procedures and/or through the controlled use of dermestid beetles. Cataloging. Mixed species collections of specimens are sorted and identified by division staff members. Donated lots bearing species identifications originating from non-FLMNH staff are verified except in cases where the original identifier is acknowledged as an expert in the taxon. Information pertaining to the where, when, and how of specimen collection is registered in the UF ichthyology Specify database using the unique field number used by the collector, or one created artificially by division staff. Specimen lots are then assigned UF catalog numbers and are linked to their corresponding collection information through the use of the field number. Official UF collection labels are produced using a Datamax printer and thermal transfer paper. Curating. 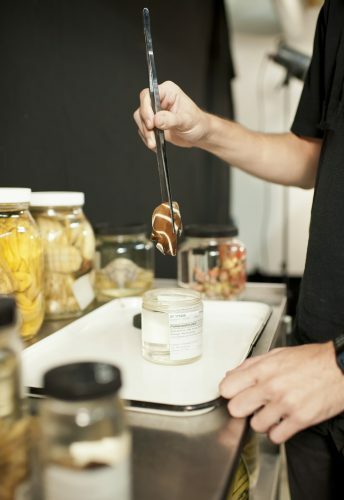 Specimens in the collection of fishes are housed in a variety of receptacles, each designed for maximum resistance to environmental factors that would degrade or otherwise reduce the value of the preserved specimens. Small specimens are housed in plastic shoulder vials with slip caps or glass vials plugged with cotton or polyester fiber. In order to most effectively combat evaporation, such vials are stored in large glass jars, which are in turn filled with the appropriate alcohol and capped. All glass jars, ranging in size from 4 ounces to 5 gallons, are capped with polypropylene screw top enclosures lined with polyethylene foam. The largest specimens are maintained in tanks of inert plastic, stainless steel, or fiberglass. Labels are affixed with a piece of alcohol resistant Dymo-embossing tape bearing the catalog number, proofed, and placed in the specimen lot vessels facing outward, taking care not to damage specimens. Finally, curated specimen lots are shelved in their proper position in the collection through the use of assigned family numbers. Within a family, specimens are arranged alphabetically using the Latin binomial or trinomial. Maintenance standards in the Division are borne of the concept that good stewardship requires vigilant observation and continuity in experienced staffing. Every reasonable effort to limit the exposure of specimens to harmful environmental factors is made. To this end, all specimen lots are stored in a controlled environment. Humidity, light, and temperature are all regulated and monitored. Specimens are shielded from long-term exposure to UV light, alcohol solutions are periodically gauged and fortified, degraded labels are transcribed or replaced, and enclosures are inspected for resistance to evaporation and replaced as necessary. From a scientific standpoint, every effort to maintain data integrity while augmenting or editing records as required is of paramount importance. Division staff members stay abreast of the scientific literature, noting and recording the appearance of museum lots in publication. Published changes in taxonomy are addressed through database editing procedures, the production of new labels, and changes in shelving order. New conclusions on phylogenetic relationships appearing in publication are considered by division staff and may result in modification of the existing phylogenetic order of fishes in the collection. Collection use consists primarily of on-site study of specimens, specimen loans to off-site users, and information requests to qualified investigators. Acceptable collection use is use that promotes scientific understanding or educational initiatives without undermining the sustainability of the collection as a viable long-term scientific resource.